I’d not been exposed to chowders growing up – the closest I’d come is oyster stew. But on my own in my 20s, I became enamored with Anna Thomas’s cookbooks, The Vegetarian Epicure and The Vegetarian Epicure Book Two. Her recipes were rich and flavorful, using full fats such as butter, cream and eggs; a rainbow of herbs and spices; and several ethnic flavors. It was in her cookbooks that I discovered chowders, with this recipe being one of my favorites. 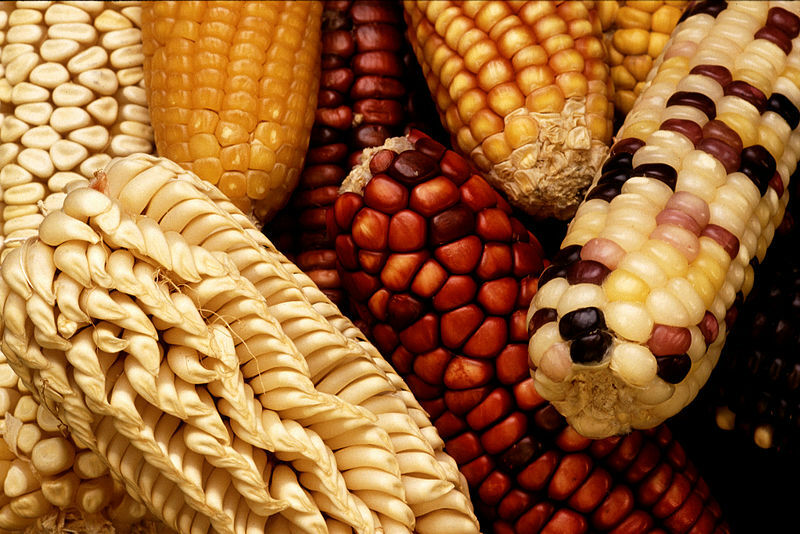 NOTE: a GMO version of sweet corn is available in some markets, but is not labeled as such. 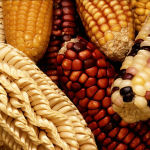 I recommend buying Organic corn to avoid the possibility of GMO, or buy from a farmer you trust. And, of course, you can grow your own. The full recipe makes a lot, so I also include ingredients for a half recipe. This is one of my favorite dinner soups, especially on a cold, snowy winter day. I’ve adapted this recipe from The Vegetarian Epicure by Anna Thomas. This is a fairly rich soup. You can use whole milk, or a combination of cream and milk, instead of the heavy cream for a lighter soup. Do not use canned, skim, low fat, 2% or 3.8% milk. Not only do these terms indicate the milk is not whole, but also that the milk has been processed beyond just pasteurization. Also, you need the bit of butterfat from whole milk or cream to help digest the minerals and to balance the simple carbs in the potato and corn. A good beer or ale instead of the white wine, makes a delicious variation. If you can find raw cheddar, so much the better, but add it at the end and don’t cook it long, or you’ll lose the “raw” benefit. Save your potato peels for a future mineral-rich Veggie broth. Prep: Grate cheese and set aside. Wash and seed bell pepper. Cut into 1/2 inch dice, about 1/2 cup (full recipe) or 1/4 cup (half recipe). Set aside. Chop herbs (chives and parsley) and set aside. Peel potato (reserve peels for future veggie broth). Dice potato into 1/2 inch cubes. Soup: Bring water to a boil in larger saucepan; add a few shakes of salt. Cook potatoes in the salted water with the bay leaf, sage and cumin seeds until just barely tender, about 15 minutes. Meanwhile, melt butter in smaller saucepan. Saute chopped onion until it wilts and begins to be transparent. Then add flour and mix well with a fork, so that no dry bits of flour are visible in the roux. Cook 1 minute more. Add cream (or milk/cream mix) to onions, stirring with a whisk until it makes a thick sauce. Pour into cooked potatoes and their water, adding also the corn kernels, bell pepper, chopped chives and parsley. Stir well. Season with chili powder (or cumin), salt, pepper and cayenne (optional). Start with only 1/4 tsp of chili powder and taste before adding more. Simmer 10 minutes. Add wine and grated cheese; stir to blend, and continue to simmer until cheese has melted. Do not allow to boil. Adjust seasoning. Serve with additional grated cheese and chopped scallions (green and white parts). This entry was posted in Alcohol, Corn family, Dairy, Fat or oil, Flour, Herbs, Simmered, Spices, Stock, broth and tagged bay, bell pepper, butter, cheddar cheese, chives, corn, cream, cumin, milk, onion, parsley, potato, sage. Bookmark the permalink.